Background: Step-down dialectical behaviour therapy (DBT) is a treatment consisting of 3 months of residential DBT plus 6 months of outpatient DBT. The program was specifically developed for people suffering from severe borderline personality disorder (BPD). The present study examines the effectiveness and cost-effectiveness of stepdown DBT compared to 12 months of regular, outpatient DBT. Methods: Eighty-four participants reporting high levels of BPD-symptoms (mean age 26 years, 95% female) were randomly assigned to step-down versus standard DBT. Measurements were conducted at baseline and after 3, 6, 9 and 12 months. The Lifetime Parasuicide Count and BPD Severity Index (BPDSI) were used to assess suicidal behaviour, non-suicidal self-injury (NSSI) and borderline severity. Costs per Quality Adjusted Life Year (QALY) were calculated using data from the EQ-5D-3L and the Treatment Inventory Cost in Psychiatric Patients (TIC-P). Results: In step-down DBT, 95% of patients started the program, compared to 45% of patients in outpatient DBT. The probability of suicidal behaviour did not change significantly over 12 months. The probability of NSSI decreased significantly in step-down DBT, but not in outpatient DBT. BPDSI decreased significantly in both groups, with the improvement leveling off at the end of treatment. While step-down DBT was more effective in increasing quality of life, it also cost significantly more. The extra costs per gained QALY exceeded the €80,000 threshold that is considered acceptable for severely ill patients in the Netherlands. Conclusions: A pragmatic randomized controlled trial in the Netherlands showed that 9 months of step-down DBT is an effective treatment for people suffering from severe levels of BPD. 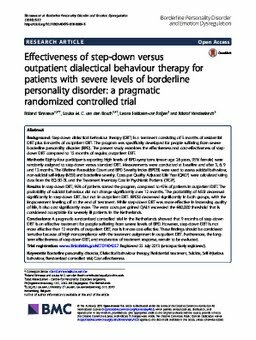 However, step-down DBT is not more effective than 12 months of outpatient DBT, nor is it more cost-effective. These findings should be considered tentative because of high noncompliance with the treatment assignment in outpatient DBT. Furthermore, the longterm effectiveness of step-down DBT, and moderators of treatment response, remain to be evaluated.